Our maps have been lying to us for centuries. The standard classroom maps we all learned geography from are based on the Mercator projection, a 16th century rendering that preserved lines used for navigation while hideously distorting the true sizes of continents and oceans further from the equator. The result is a widespread misconception that Greenland is as big as Africa, Siberia and Canada are disproportionally massive, and that Antarctica apparently just goes on forever. In reality though, Africa is larger than all of North America, and the Antarctic is about as big as Australia. That’s the difficulty with stretching a sphere to fit a rectangle, and for centuries cartographers have struggled to balance maintaining straight latitudinal lines with the preservation of perspective. But the AuthaGraph may be the pinnacle of accuracy. For centuries, cartographers have made numerous attempts to account for the inconsistency. Maps are compromises between distorting the angles of latitude and longitude lines and the relative areas of the continents and oceans. Some were made for specific purposes, while others just tried to find the cartographic sweet spot. The problem was so widespread that a French mathematician even developed an eponymous equation to quantify the degree of distortion that a map experienced. Called Tissot’s indicatrix, the equation takes the form of circles placed at regular intervals across a map. By calculating how much each circle deforms, it is possible to determine how much the map is pulling and stretching the continents out of shape at that point. Here are a few of the different ways cartographers have tried to depict the Earth. Sinusoidal Projection: This map bowed out the equator in an attempt to replicate the topography of a sphere and avoid stretching out areas far from the equator. It succeeds in presenting a more accurate view of the poles, but at the cost of misshapen continents and bent meridians. Areas near both the equator and prime meridian are accurate, but the distortion gets worse the further you go from either. 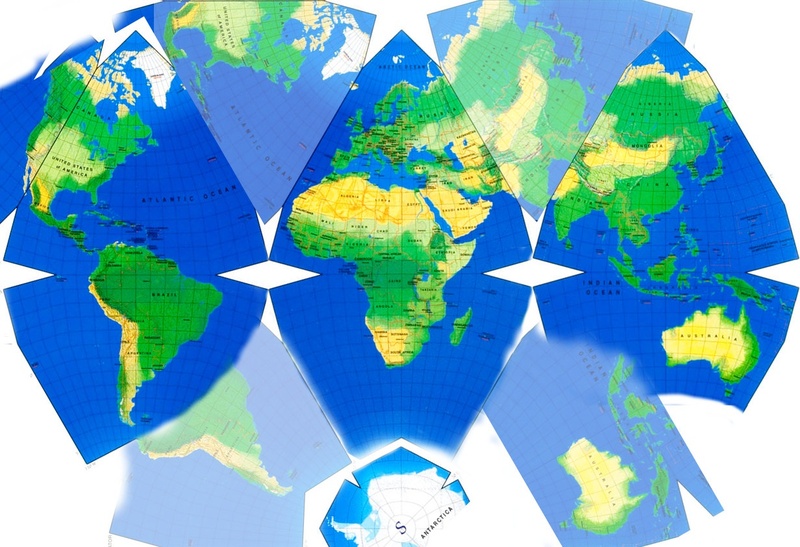 Robinson Projection: This attempt at creating a faithful world map took a similar tack to the Sinusoidal by pulling out the edges of the map to mimic a sphere. The Robinson isn’t as extreme, however, taking the form of a much more gentle oval. The map was an attempt at a compromise between distorting the areas of continents and the angles of coordinate line. It was used by both Rand McNally and the National Geographic Society at one point. Bonne Projection: A more outside-of-the-box example of mapmaking ingenuity, the Bonne Projection actually dates back to the 16th century. The heart shape preserves integrity near the center, but gets progressively more unrealistic as it moves outward. Keeping the focus on Europe and Africa means that most areas of interest to early cartographers were rendered nearly accurately, although Australia does suffer some unfortunate stretching. Armadillo Projection: This map attempts a kind of 3-D simulation by projecting the map onto a torus. This keeps the continents in decent shape while causing the oceans to appear smaller, and cutting off half of Australia and all of New Zealand. As with other maps, the tops and sides suffer from the most distortion. We may finally have a faithful flat map, however. The 2016 winner of Japan’s prestigious Good Design, designers figured out how to translate our spherical world into a rectangular box. Hajime Narukawa, a Tokyo-based architect and artist, broke the globe up into 96 regions and folded it into a tetrahedron and then a pyramid before finally flattening it into a two-dimensional sheet. The multi-step process preserves the true dimensions of the continents by angling them outward instead of stretching them, maintaining the illusion that they’re all laid out vertically like we’re used to. Their website states that the goal was to create map better suited to address the problems of the 21st century, including rapidly diminishing sea ice and territorial claims of marine territory, by more accurately depicting what areas near the poles actually look like. Called the AuthaGraph, the result is a map that looks a little different that most of us are used to. Seen in rectangular form, Antarctica is intact and at the bottom right. The Americas and Africa are tilted inward and pushed to the upper corners of the map, while Australia sits perfectly upright at the bottom center. The lines of latitude and longitude veer in odd directions, the result of transformations that broke them from their naturally spherical configuration. Most importantly, the continents are all rendered as they actually appear. Africa has regained its geographic primacy while North America and Europe are shrunk back to their true sizes. The oceans, too, are finally represented accurately. By breaking longstanding rules governing how the continents and lines of latitude and longitude should appear, Narukawa has achieved a geographically accurate depiction of Earth. This would make awesome bathroom tiles. His projection can even be tessellated to create a never-ending sequence of continents laid out next to each other. You can buy an origami version of his map composed of tiny segments separated by seams that folds from a globe to a sheet and back again. The path of the International Space Station, as mapped over a tessellation of Narukawa’s world map. Narukawa says that his map is not quite accurate yet — some regions are slightly distorted. He hopes to perform even more subdivisions of his globe to achieve truly accurate representations of the continents. You can always tell who is the most powerful country in the world by the maps. Greece, Rome, all once were the center of the world. For years, it was the English speaking world that put England at the heart of it all. Now it’s Russia, China, and America at the center of the world. I actually see a big ocean in the middle… maybe it is Atlantis! The subject of the article is the new AuthaGraph map, the first photo, referred to as the “winner”. That map shows Russia, China and America in the most central position, of all major land masses. But. maybe it’s just me. I think the author of the AuthaGraph map has secretly invested in land futures in Siberia and Brazil. Countless schoolchildren looked at the old familiar world map and wondered if Africa and America seemed to fit like a jigsaw puzzle. Might have taken a while longer to come up with that theory if the AuthaGraphic map had been available, and in wide use. I’m losing big time with my observation that America, Russia and China occupy the center of the new map. In the top-most image of the article, above the page title, I see Japan as the center-most major country. I will leave that to others to decide the accuracy of my observation and/or its implications because this comes from a Japanese competition. The Bering Strait, between Russia and America is central. Since compass points don’t seem to be relevant to this map, it would seem that any point could be centered, and any direction placed at the top, and then you simply shift the grid to match that. But what do I know I’m just an ostrich. Being powerful will make you print more maps and you’ll put yourself into the center (others will just use the most common kind of maps if appropriate), but also the pacific ocean is the most convenient place to draw a line from north to south without splitting a continent. Indeed. Great Britain put itself firmly at the center of things with its arbitrary zero degrees of longitude than ran through London. You were always East or West from Greenwich. Even set the world’s clock, GMT. And by center of the world you mean Europe, West Asia and N. Africa. Africa has always, is and will always be the most powerful country in the world. and given that man evolved there, should be WAY more advanced than any other place…what happened? Is that really Brazil? Otherwise, wow! A Euclidean triangle’s three interior angles sum to exactly 180°. This is better than true – it’s Euclid’s Fifth Postulate. (One parallel line through a point not on a given line is its dual.) No Earth’s surface triangle can contain as few as 180°, and 540° is trivial. All Euclidean maps of Earth’s surface must be distorted, folded, or cut. Geometry must be banned by law and violent enforcement. Projection of a double-curved Semitic face onto a flat linen sheet without distortion is inescapable fraud – the Shroud of Turin. How about we just give people a proper education so they understand that it’s impossible to render a 3d image as 2d without introducing distortion. Then maybe we won’t have to come up with stupid clickbait article titles. I’d love to see a compass rose, the equator and both tropic lines added to this. Brazil looks bigger than both the USA and China and just about the same size as Canada. this map may be the next great idea in maps, but needs to be worked on a little bit more as Canada, China and USA are all larger in square miles than Brazil. All very similiar in size and Canada IS THE WINNER!! It’s the baby of them all. The main US territory (between MEX and CA) is actually smaller than Brazil. US is wider thanks to Alasca, Hawaii..
Who decided birth or south? Think about it. That we know of as of today, the explores that we know of, almost all of them came from what was named,the northern hemisphere. Remember, those who win get to write the history, or even rewrite the history to make themselves look good. Remember, the winners get to write the history. That is why there is north and south as we know them today. Projecting a 3-D curved surface to a 2-D flat sheet exactly would be a near impossible job. The most accurate world map (only when compared to others) is still not exact. Protruding Brazil seems rather awkward if not over-sized. It is physically impossible to get the map proportionally perfect as you couldn’t get down to the exact atom and particle. I think I’ll just stick with a globe. Do globes reflect the earth accurately? If so, why not do our global thinking with globes, our small-scale stuff only with maps? Today, it’s so easy to have some CGI that shows the globe, we should be able to make that happen in almost any articulate discussion of global events, so that there is no need for a wall map anymore. I love maps also, but sometimes prefer to hold a real spherical world globe in my hands. Call me three dimensional (or a sphere-head) I guess. But the earth isn’t a perfect sphere either. Shall we call you egg-head? Nah.. I prefer spherehead. The Earth is much closer to being perfectly spherical than egg-shaped. BTW, why do we capitalize EVERY other place (and planet) name, except that of our own home planet, Earth? “Earth” is capitalized when we speak of it as a planet, as you have done. In that case, Earth is its proper name, same as Saturn, Mars, etc. “Earth” is not capitalized when we refer to the ground beneath our feet, just as we don’t capitalize “sidewalk” or “street”. “Street” IS capitalized when it is part of a name, though, like Main Street. So it all depends on how “earth” is used. I guess “pedantic” is not capitalized either. “Trivial” is sometimes capitalized however, as in when it comes at the beginning of a sentence. Also, “obvious” is sometimes not capitalized, like when it doesn’t come at the beginning of a sentence. Thankfully I have capitalized Troll for you. I was responding to Sandra Horn and not you. No idea how my reply was linked to yours. Could have simply been an errant mouse click. Sorry if that was the case. No need to apologize. This is just an innocuous banter. No offense meant and none taken. Cheers. It’s only technically not a perfect sphere. The issue is scale. When people do calculations on paper it appears to be as you said egg shaped. The truth however, is that when looking at it in proper scale the lack of spherical uniformity is nominal. Just look at views from space. The earth may not be a perfect sphere but when looked at from a wider view it’s darn close. I’d call you two dimensional. I’ll just call you what you are, inferior. This summer I traveled to Svalbard, waaay north of Norway. It is at 78-79 degrees north, a good 700-800 miles from the north pole. Today I looked at Svalbard on one of the older globes in my house. It is so far north that it barely shows on the map, and is essentially covered by the metal ring at the top of the globe. So NO, it is not a given that globes represent the earth accurately either. The UN logo. Consider it. I agree the UN is the most accurate. I am doing my own set of research into this whole “Earth’s true shape” and it’s interesting. Our leaders are hiding everything in our eyesight hoping we are too busy slaving at work, and otherwise distracted to see what is right in front of us. The UN logo is just a top-down map, isn’t it? That means the farther it is from the north pole, the more mishappen it is. Antartica isn’t even shown. Try this instead, make more sense. This map still distorts the map of the world. But it does so in a geopolitical sense. It shows it from the perspective that focuses first on the Asian continent showing it on the left, instead of showing the the North and South American continents on the left as everyone is used to seeing on all other maps. For the sake of uniformity, backward compatibility in software language, he should show the North and South American continents on the left as people are used to seeing, instead of this politically motivated map. Until he does, I will stick with what we already are accustomed to seeing. Antartica looks so big that it’s scary. 1 – The United Kingdom looks about 4.5 times bigger than Ireland. It is only about 2.5 times the size in reality. Ireland is rather overall unchanged on the Mercator Projection. 2 – Norway has a length comparable to that of Australia’s. Australia’s is quite a bit longer in reality. Norway’s length is only about 75% of that of the United States. This is shocking and there’s only one thing to do … start colonizing again immediately. hello. i’m looking for real size map of the world. i need it to put on my class room wall. anybody know how could i get something like it? Here’s an idea…. Take the exact scale size of the continents, cut them out and place them on a sheet of paper at their approx distance and position from each other to their exact scale…. no land mass distortion and while the oceans might not scale exactly…it’s easy enough to show an accurate enough map. Why is it so damn difficult for people to just put the continents in their ACTUAL SIZE and place them up next to each other?? I don’t care about the oceans. I just want the continents at true size, side by side. THAT IS NOT ROCKET SCIENCE. Each map is useful for the purpose it is intended for. Try drawing some lines of latitude and longitude on this map, then see how much use it is. It may show the relative sizes of land masses more accurately (possibly), but it is pretty useless for showing the juxtaposition of countries which is the more useful aid to understanding geography. No matter how a globe is mapped to a flat surface, it’s going to be distorted in the process. There are differences in what kinds of distortion, what parts are most distorted, and how evenly the distortion is distributed, but there is no way to escape there being distortion. I would, however, love to see the kind of interactive puzzles available online for the Mercator projection done with this map, as well as several other projections I haven’t seen it done with, such that you can drag some silhouette of a map feature around the map and watch the distortion change. Doesn’t Mexico measure larger than Alaska? If so the map is still incorrect. This map may lie less about the shapes of continents than most other flat maps, but it’s a very big lie about distances and bearings between continents. Antarctica is not east of Australia. Etc. All flat maps are an approximation. You choose the flat map appropriate for what you want to show, but there’s no escaping the fact that no flat map can accurately depict a curved surface – something has to give. It’s so funny that we can’t get one straight answer about what the earth looks like. I don’t believe any of them and I don’t care. It’s easy to represent the earth on a flat surface, it has been done to perfect detail. cgi is for cgidiots. You live in your cgi world, might has well be cause you already believe fake news, snowflakes love cgi. How can this be the pinnacle of accuracy when it’s latitudinal lines are so clearly distorted? As you said maps are an attempt to balance maintaining straight latitudinal lines with the preservation of perspective to gain accuracy. This map completely throws out any attempt to maintain straight latitudinal lines. Guess how useful that would be for navigation? But that’s okay because this map clearly isn’t meant to be for navigation. Just remember it’s not possible to accurately depict a spherical object on a 2D surface. To get more accuracy in one area you will inevitably lose some in another. Maps always lie as they don’t label the places with the native tongue. Eg: Deutschland is called Germany and London is called Londres or Londra. I was looking for a scale map of the continents and this article was just not helpful! This is why schools need globes. The classic double trick was which is a bigger country Russia or Africa. What I want to see is a globe that shows the geography of Earth with no political/national borders, no labels, no names. Virtually a composite photo of Earth as seen from space, minus cloud cover. Just the shades of blue, green and brown that define the real planet, all wrapped onto a globe. I don’t know why someone hasn’t done this yet – or if they have, where can I get one? Even Narukawa’s map would be far better without all the traditional, limited thinking that dictates that a map of the planet must include all the human constructs. God knows we have plenty of those, far more than enough. I want to see the planet’s geography/topography as it really is. Earth is flat and motionless. Nowhere has there been a scientist that shows water curving, that is because it is a scientific fact that water does not curve and it will always find its level. It is a scientific fact ignored by mainstream science and adherents of it, not out of reason and observation but out of a mere desire to conceal the truth and the appeal to authority. It is also a fact, as observed throughout history that the majority does not think, it is just an element of truth that it will be denied and ridiculed by the many before being accepted as self-evident. As philosopher Arthur Schopenhaur noted, “all truth passes through three stages. First, it is ridiculed. Second, it is violently opposed. Third, it is accepted as being self-evident.” The only logical explanation to the earth’s true shape is that it is flat given that all observable water, regardless of where it sits, remain flat, seeking it’s natural course. The earth’s alleged curve is nothing more than the metaphorical cell of the mind and spirit. Earth a plane and not a planet.